This is truly one of the great ways to cook chicken – the colour and crispiness of the skin rivals a good roast, and there's something satisfying about cooking it perfectly this way. I have described how to cut up a chicken in the method, but you can, of course, ask your butcher to do this for you. Any root vegetable puree is great with chicken – the last of the Jerusalem artichokes and quality celeriac are around, so mix it up and enjoy. 1. For the puree, place the pumpkin in a saucepan and add cold water until it sits just below the top of the pumpkin. Add the half-teaspoon of salt and simmer until soft, about 20 minutes. Drain any remaining water and set aside. 2. Meanwhile, heat 50g of butter in a heavy-based saucepan over low heat. Add the onion and the extra sea salt and saute until the onion is very soft, about 5 minutes. Add the pumpkin and cook for a further 2 minutes. 3. Puree the mixture in a food processor or blender. Stir in the extra butter until completely melted. Check the seasoning. 4. For the chicken, remove from the refrigerator 1-2 hours before cooking. Put the chicken on a chopping board and remove the wing tips. Remove both legs and cut them in half. Remove the backbone, cut down the breastplate, then cut each breast in half. Season the chicken pieces with sea salt. 5. Heat the extra virgin olive oil and half the butter in a heavy-based frying pan over a medium-high heat. Add the chicken pieces, skin side down, and cook for 5 minutes, or until the skin is nice and brown. Turn the chicken pieces over and add the garlic. 6. Cover and reduce the heat to low. After about 20 minutes, remove the breasts and keep in a warm place. Cook the legs for another 5 minutes, then remove and keep warm with the breasts. Keeping the heat on low, add the vinegar to the pan and scrape with a wooden spoon, then add the remaining butter and whisk it until it melts and forms a sauce. Don't let the sauce boil or it will split. Check the seasoning, add the tomato, parsley and freshly ground black pepper to finish. 7. 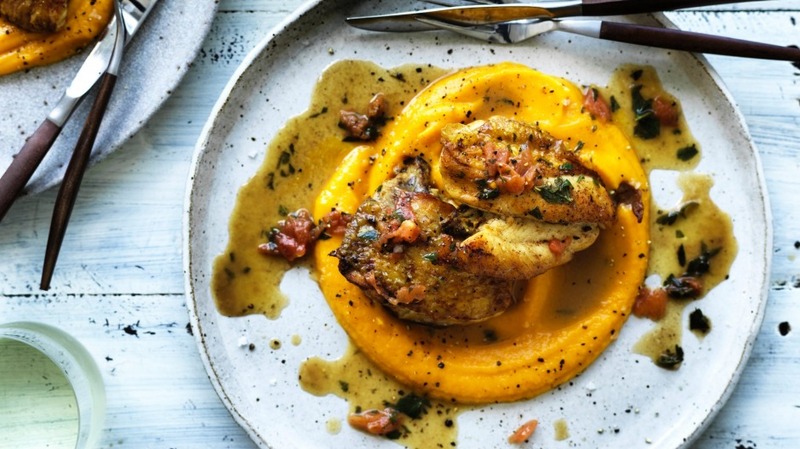 To serve, spoon the pumpkin puree onto four large white plates, top with crispy chicken and spoon the sauce over the top.